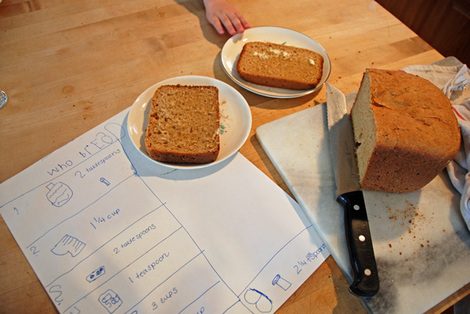 So here, my friends, is the recipe for the WHO Bread I photographed last week. And here's a little surprise about it (and me): it's a bread machine recipe. I know, I know. You're surprised, aren't you? I will admit - I wasn't interested in a bread machine for um, years. I'm not only stubborn, but I get a little skeptical about the latest and greatest 'thing' we're supposed to 'need'. Truth be told, elaborate kitchen gadgetry kind of irritates me (where to put it all?, to begin with). But then...last year I found myself staring right at a brand new one at a yard sale for $2 (I think used & good condition bread machines are plentiful in the thrift world), and I thought I should give it a try instead of just grumping about them, as I had been doing. I won't say that I'm hooked - I really love making bread by hand. I truly do. The entire process of baking bread by hand gives me so much pleasure. Except for the times when it doesn't give me so much pleasure. And then I happily use the bread machine. My absolute favorite part of making this bread (which is likely no surprise), is that the kids can be so easily involved. Ezra - who loves to cook- writes & draws the recipe over and over and can nearly do the process entirely by himself. If it weren't tasty anyway, the feeling of success that it gives him would win me over too.